Last fall, Hasbro and EA did what, in theory, should have been impossible: release five versions of essentially the same game with each garnering tremendous success. Each of the three DS offerings, along with the PC and Wii versions achieved an immediate following, with consumers either not noticing or caring that they were buying the same game multiple times. Where the three (now four) DS versions differ from each other in overall theme (Winter, Jungle, Spring, etc. 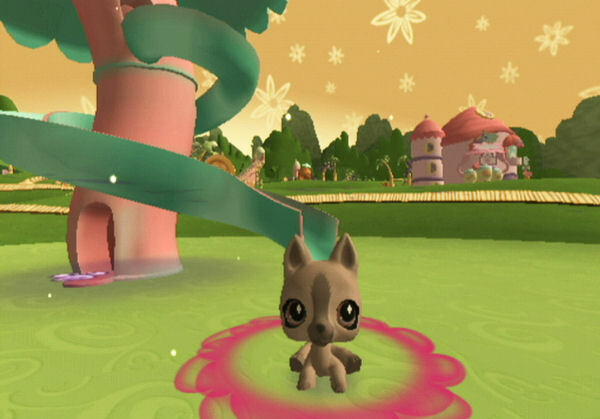 ), Littlest Pet Shop for the Wii combines aspects from all other versions of the title to create the largest Littlest Pet Shop available to date. This Wii version of the title starts and plays as all of the others do. 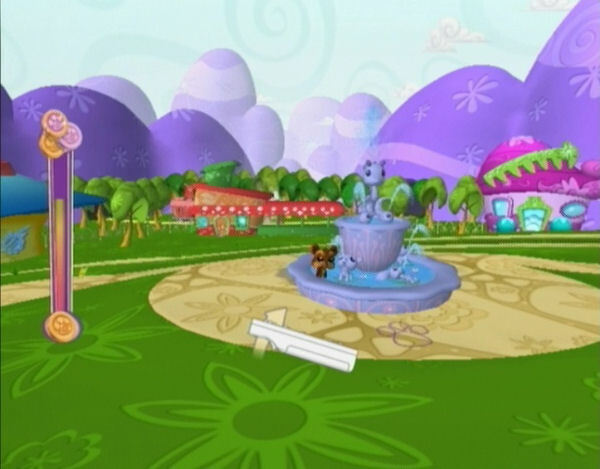 You begin by traveling to Pet Plaza, the center hub for your own Littlest Pet Shop, where you are greeted by three pets. From there you have access to the Meow Market, where you can purchase accessories for your pets (hats, sunglasses, dresses, and dozens of other "wearable" items), along with play-sets and even more pets. 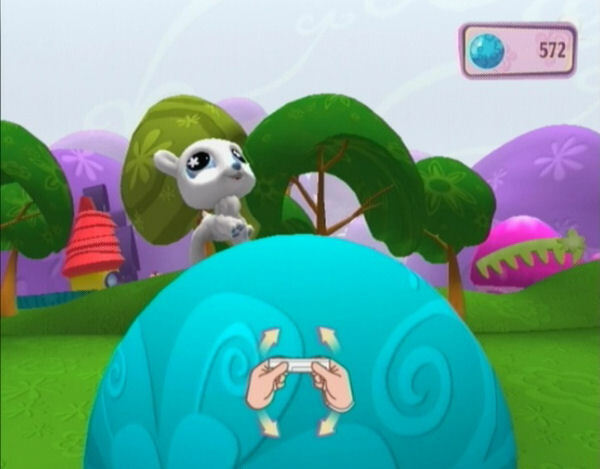 The game (via pop-up text bubbles) introduces you to the main goal of creating the biggest Littlest Pet Shop the world has ever known, filled with dogs, cats, penguins, hamsters, horses, frogs, polar bears, rabbits and so on, and proceeds to hold your hand through the entire process of achieving said goal. As your pet shop can only grow after you purchase new items and pets for it, the majority of your time will be spent earning Kibble, the game's currency, in one of the title's 16 mini-games. As with the other titles in the franchise, these mini-games are highly varied, and see you choosing one individual pet with which to play before beginning the game. While some games like Steady Spin, Bubble Bounce, and Whirl & Twirl have carried over from the DS versions of the title, the controls have obviously received an overhaul during the transition. Steady Spin, for instance, now has you holding the Wii-mote horizontally, gradually titling it left and right to keep your pet walking on top of a rotating ball. Tilt the controller too far in one direction or forget to rotate the Wii-mote entirely and your pet will fall off of the ball, thus ending the game. Likewise, Bubble Bounce has been changed from a simple "tap the touch screen" game to one that requires you to point your cursor underneath falling coins, and hold the A button to create bubbles off of which the coins will bounce. 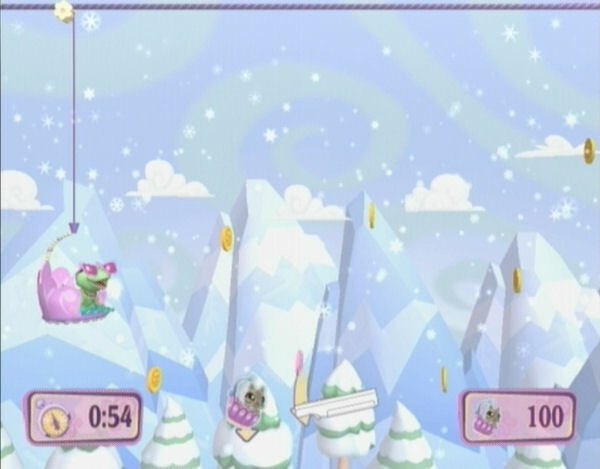 The object then is to keep as many coins bouncing at once as possible, without letting them fall into the water below. While most of these games were able to survive the transition with ease, others, like "Coloring Craze" have been deleted altogether. 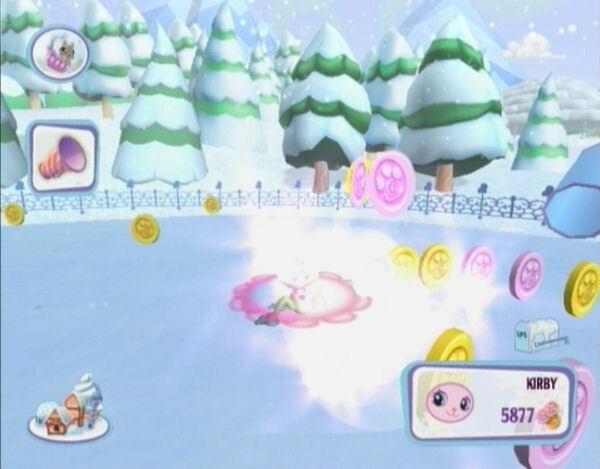 Coloring Craze is an understandable deletion, as the game required very nimble movements and would be almost impossible to perform with nothing but the Wii-mote, but its disappearance is disappointing as the game easily provided the greatest amount of Kibble per play of all of the games in the series. That being said however, the Kibble system isn't actually as skewed here as it is in the DS versions of the title. Even though there are still some games that provide a lackluster amount of Kibble per play, especially when considering how long one game takes (Hide and Seek, I'm looking at you), others like Bubble Bounce now offer a staggering 1500 Kibble or more per play (depending on which difficulty level of the three you choose), which is a much appreciated factor when pets 25-32 easily cost over 700 Kibble a piece. Rounding out the mini-game department in this version of the title are multiple console game exclusives, with most of these exclusives offering more challenge in just one game than found in the entirety of the handheld offerings. Beats & Bops, for instance, is a fast paced rhythm game that has you tapping on the control pad to match arrows that zoom across the bottom portion of the screen. There are three songs to choose from, and even though the easiest difficulty is just that: easy, the hardest difficulty sees you bashing on left, right, up and down in such a rapid succession that it's almost impossible to make it through without screwing up, with this issue mostly being due to the fact that the control pad on the Wii Remote is so small to begin with. Apple Grab, another new game, has you clicking on red and green color-changing apples to pick them from a tree and drag them to their appropriate colored basket (take too long and the apples fall off of the tree) and Bouquet Breeze turns your pointer into a fan that must be aimed at falling flowers of varying sizes in an effort to blow them into a vase which sits at the center bottommost point on the screen. 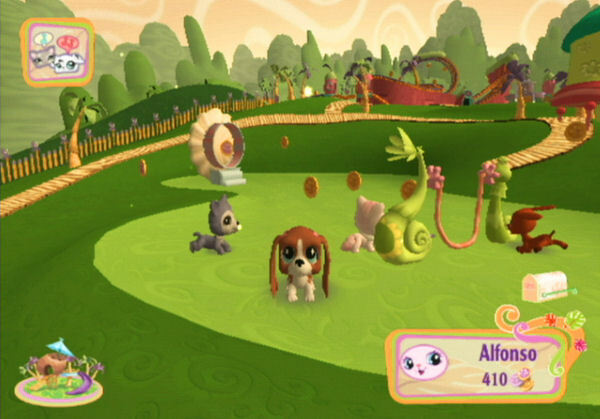 Aside from mini-games, there are other interactive portions of the title aside from simply dressing up your pets to match one of the four gameplay environments (the standard spring-like Pet Plaza, a colorful garden, a lush jungle and a snow-covered ski resort). These portions can be considered miniature mini-games, which last perhaps ten or fifteen seconds at most, and see your pet interacting with one of the numerous "play-set" pieces that you purchase for them at the Meow Market. 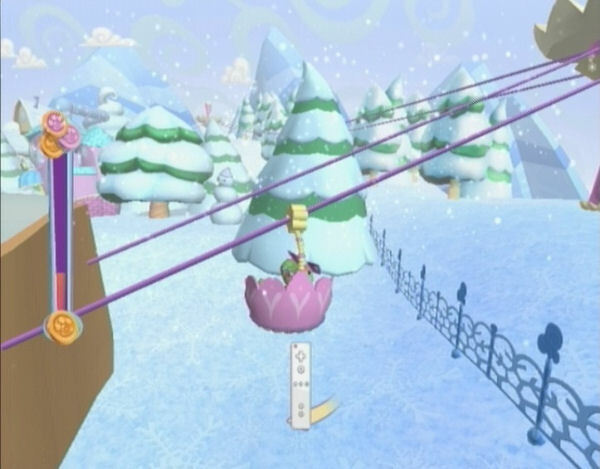 Items like the swing set and the treadmill have you rapidly swinging your Wii-mote through the air in order to gain momentum, while the jump rope and the ski lift challenge you to fill a bar, once again by swinging the Wii-mote, before your pet can complete the game. Doing any of these tasks nets you a very small amount of Kibble (less than 50 in most cases), so while they are not great ways to make money, they do allow you to spend more quality time with your pets and simply stare at their mind-boggling cuteness up close. Finally, since your pets are living creatures, the last task on your plate will concern your pets' happiness and well-being. As you select any of your pets, a small avatar is located in the bottom right corner of the screen that alerts you to their mood. A sad face means your pet is either tired, hungry or both. By clicking on said avatar, you can feed your pet or give them a good scratching, which will return their status to that of a happy pet. You can also check the status of your pets by simply observing them, as tired pets will often hang their head low, indicating they are low on energy, or will seclude themselves from the fun activities surrounding them until you notice that they require your assistance. By keeping an eye on your surroundings at all times, you can prevent any one individual from being neglected. You'll also be able to better enjoy the great graphical work present in this version of the game. The entire theme of both the graphical and sound departments is, for the most part, a copy-and-paste job from other titles in the series, but the graphics this time around are undeniably more polished and adorable. There are almost no sharp or right angles to be seen; instead, the game is filled with soft lines, and a pallet containing not just bright hues but also plenty of pastel colors that make the title look far better than I initially expected. Likewise, where most of the game is concerned, the soundtrack is the familiar song listing of upbeat instrumental music comprised of catchy rhythms that is sure to have any young girl humming along in moments. In addition, the new games like Beats & Bops add a touch of variety to the soundtrack, by offering more techno inspired tunes not found in other versions of the title. 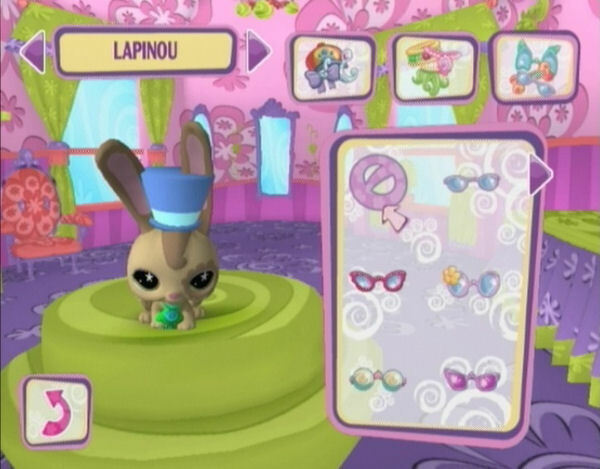 With 32 pets and dozens of play-sets and accessories, along with more challenging and unique mini-games, Littlest Pet Shop for the Wii offers a much grander and far more entertaining experience than its DS brethren, which is actually saying a lot, since the DS versions packed an entertaining punch of their own. Regardless of its multiple counterparts' convenience of portability, if you only have the funds available to buy one game in the Littlest Pet Shop franchise, this needs to be it. Special thanks to Erica Thomas and EA for providing a copy of this title.